In the early 19th century, when a standardized uniform did not yet exist in the U.S Navy, some sailors adopted a style of wide trousers ending in bell-shaped cuffs. 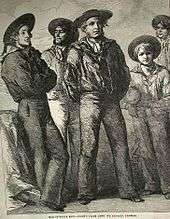 In 1813, one of the first recorded descriptions of sailors' uniforms, written by Commodore Stephen Decatur, noted that the men on the frigates United States and Macedonia were wearing "glazed canvas hats with stiff brims, decked with streamers of ribbon, blue jackets buttoned loosely over waistcoats, and blue trousers with bell bottoms." The British Royal Navy had often been a leader in nautical fashion, but bell-bottoms did not become part of the standard uniform until the mid-19th century. These "bell-bottoms" were often just very wide-legged trousers, rather than shaped trousers that flared below the knee. They continued in use as a distinctive feature of the RN rating's "square rig" uniform until replaced by more conventionally flared trousers in 1977. Although the trousers of the present-day uniform of the United States Navy are still referred to as "bell-bottomed", they simply have large straight legs. The sailor's thigh fills the upper trouser leg, making the bottom of the pants leg appear flared. This style has been popular for many years, perhaps originally because the trouser leg can be rolled up easily, allowing the sailor to work in bare feet, but there is no reliable documentation that confirms a specific timeline or reason for the popularity of bell-bottomed trousers in naval apparel. 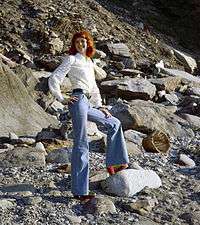 In the mid-1970's, bell-bottoms became fashionable for both men and women in Europe and North America. Often made of denim, they flared out from the bottom of the calf, and had slightly curved hems and a circumference of 18 inches (46 cm) at the bottom of each leg opening. They were usually worn with Cuban-heeled shoes, clogs, or Chelsea boots. Toni Basil, who was a go-go dancer when the 1964 concert film the T.A.M.I. Show was released, appeared in the film wearing bell-bottoms with a baby doll blouse. By 1967, bell-bottoms had moved from high fashion to part of the hippie counter-culture movement, a style exemplified by love beads, granny glasses, and tie-dye shirts. Bell-bottoms are mentioned in the popular music single "Bell Bottom Blues" by blues-rock group Derek and the Dominos. In the 1970s, bell-bottoms moved back into mainstream fashion; Sonny and Cher helped popularize bell-bottoms in the US by wearing them on their popular television show. The pants were typically flared from the knee down, with bottom leg openings of up to twenty-six inches. Made from denim, bright cotton and satin polyester, they were so popular that they became a symbol of the outlandish and colorful style of the decade. Loon pants (shortened from "balloon pants") were a variant on bell-bottomed trousers, with an increased flare. They were worn occasionally by go-go dancers on the British television music variety show Ready Steady Go! in 1966. Elephant bells, popular in the mid-to-late 1970s, were similar to loon pants, but were typically made of denim. Elephant bells had a marked flare below the knee, often covering the wearer's shoes. The preferred shoes were platform shoes with soles at least 2 inches (5.1 cm) thick and heels 4 to 5 inches (10 to 13 cm) to keep the pants' hems off the ground. In 1996, women's bell-bottoms were reintroduced to the mainstream public, under the name "boot-cut" ("boot-fit") trousers as the flare was slimmer. By 1997, flare jeans had come into vogue among women, which had a wider, more exaggerated flare than boot-cuts (boot-fits). The boot-cut (boot-fit) style ended up dominating the fashion world for 10 years. By around 2006, the bell-shaped silhouette started to fade as the skinny jean rose in popularity. Sharon Haver, the founder of FocusOn-Style commented "It's as if all the girls wearing premium boot-cut (boot-fit) jeans threw them away one day, and the next day began wearing skinny jeans and flats." However, boot-cuts (boot-fits) and flare jeans never entirely went away, and both of these styles remain relatively popular today both in denim fashion and higher-quality office wear. Women's boot-cut jeans are tighter at the knee than men's, and flare out from knee to hem. Men's styles are traditionally straight-legged, although the pants came in a more flared style in the early and mid 2000s, but this was optional. The bell-bottoms of the 1960s and 1970s can be distinguished from the flare or boot-cut (boot-fit) of the 1990s and 2000s by the tightness of the fabric at the knee. 1 2 Ohl, Bob (June 1955). "Have Bell Bottoms...Will Travel". All Hands. 460: 28–30. 1 2 3 4 Dervis (March 23, 2000). "Bell Bottom Blues". Made to Measure Magazine. Archived from the original on 2006-04-09. 1 2 Department of the Navy Bureau of Naval Personnel (1981). "History of U.S. Navy Uniforms: Appendix 2". United States Navy Uniform Regulations. Washington, DC: US Government Printing Office. NavPers 15665D. 1 2 3 Cobb, Nathan (July 19, 1993). "Bell-bottoms back, but the thrill is gone". The Boston Globe. ↑ "Bell-Bottoms Facts". Encyclopedia.com. 2004. Retrieved 2012-10-16. ↑ "Fashions: Year In Review 1996". Retrieved 19 June 2014. ↑ "Fashion in the 1990s". Retrieved 19 June 2014. ↑ "Skinny legs and all: Jeans get slender". USA Today. Retrieved 19 June 2014. ↑ "Wearer beware of "mom jeans"". Retrieved 19 June 2014.